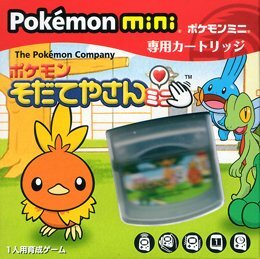 Pokémon Breeder mini was the final Pokémon mini game. This game has Professor Birch give you a special Pokémon egg. This egg will hatch into one of the Hoenn starter Pokémon: Treecko, Torchic and Mudkip and you then have to take care of it. To start off, to hatch your Egg you need to put it in your nest and rub it back and forth. This will cause the Egg to hatch and your Pokémon to appear. From there, you can start raising it. When inside the room, you can feed it, clean it and play with it using various toys. This will boost their happiness. You can shake the Pokémon mini to get its attention as it will rush up to you. Pokémon have got four separate skills and as you improve their skills, they end up requiring more sleep. The skills are: Friendship, Strength, Intelligence and Beauty. When three of the four skills hit the maximum, the Pokémon must go to a new owner and the game restarts. With each activity you do, your Pokémon's energy will go down and when it hits bottom, the Pokémon will try to fall asleep. Turning the lights off helps increase the energy quicker. 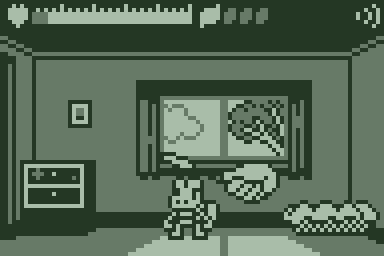 You can play with the Pokémon both inside or outside the house and sometimes other Pokémon will visit. To help with improving your Pokémon, you can play with various toys obtained for the Pokémon. These are obtained as your Pokémon gets older and each have their own different mechanic. This will make your Pokémon's energy levels decrease so will require your Pokémon to rest after completion. Bubble Wand Creates bubbles for the Pokémon to chase around the room. Bucket Drop on the Pokémon and they'll try to get it off their head. Camera To take a photo of the Pokémon. Feather Wave it around for the Pokémon to chase it and over it for the Pokémon to jump. Ghost Causes the Pokémon to run away from the toy. Piano Lets the Pokémon try to play various pieces of music.